You may be interested in OneTaq® Hot Start Quick-Load® 2X Master Mix with GC Buffer (NEB #M0489). 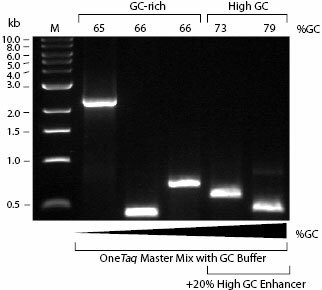 OneTaq® Quick-Load® 2X Master Mix with GC Buffer is an optimized, ready-to-use blend of Taq and Deep VentR ™ DNA Polymerases ideally suited to PCR applications from GC-rich templates, including pure DNA solutions, bacterial colonies and cDNA products. The 3´→5´ exonuclease activity of Deep Vent DNA Polymerase increases the fidelity and robust amplification of Taq DNA Polymerase (1). The convenient quick-load master mix formulation contains dNTPs, MgSO4, buffer components and stabilizers as well as two commonly used tracking dyes for DNA gels. On a 1% agarose gel in 1X TBE, Xylene Cyanol FF migrates at ~4 kb and Tartrazine migrates at ~10 bp. Both dyes are present in concentrations that do not mask co-migrating DNA bands. Amplification of a selection of sequences with varying GC content from human genomic DNA using OneTaq DNA Polymerase. Amplicon sizes are indicated next to gel and GC content is indicated above gel. Marker M is the 1 kb DNA Ladder (NEB #N3232 ). Product specifications for individual components in the OneTaq Quick-Load 2X Master Mix with GC Buffer are available separately. OneTaq Quick-Load 2X Master Mix with GC Buffer is stable for fifteen freeze-thaw cycles when stored at -20°C. OneTaq Quick-Load 2X Master Mix with GC Buffer is also stable for one month at 4°C, so for frequent use, an aliquot may be kept at 4°C. Barnes,W.M. (1994). Proc. Natl. Acad. Sci. USA. 91, 2216-2220. What type of DNA ends result from a primer extension reaction or a PCR using LongAmp™ Taq DNA Polymerase?